The Best Example of a Human Email…EVER. This was the opening paragraph from Eat24’s May 16th weekly coupon email. 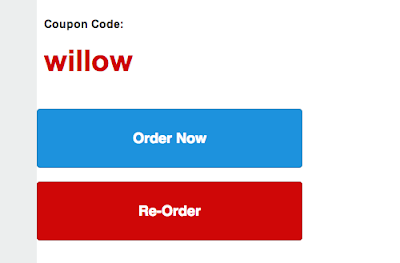 The first three lines of this “weekend coupon” email had nothing to do with a coupon, or food, or restaurants. Not only did the opening paragraph not include the central call-to-action (which was to use their new coupon), it detracted from the CTA by asking readers to tweet about a trending topic – Jay-Z and Beyonce, of course. But as you can see from a Twitter search of the #Eat24Investigates hashtag, lots of people are playing along. And having some fun…with a company. Awesome. Amazing. Human. It reminds me of the “Fitbit 2013 Activity Summary” email I recently got (minus the unicorns, rainbows, roller skates, and dinner plates, of course). 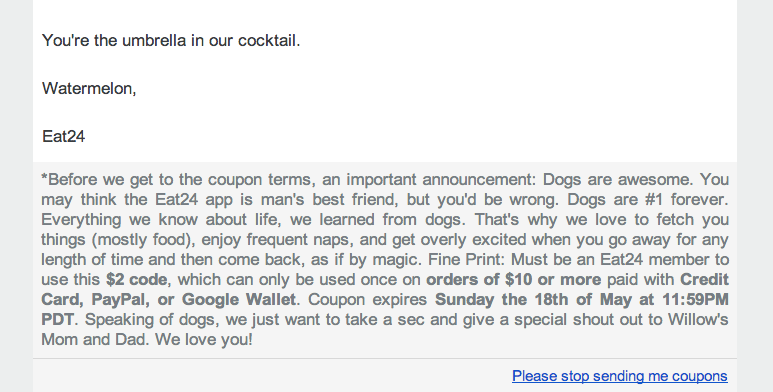 Eat24 figured out a way to make people actually read the fine print. How? They made it unique. They made it fun. They made it human. And while the connection may seem random (dogs? ), they tied it all together: “fetch you things (mostly food)…” Brilliant. Also, the coupon code (“Willow”) is apparently the name of a dog. Bonus: Notice the opt-out language? 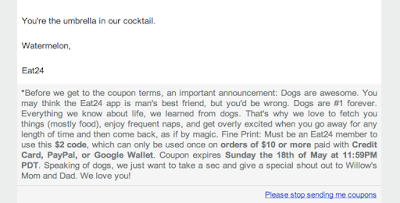 “Please stop sending me coupons.” Ha! Anyway, Eat24 doesn’t just keep things human in their email campaigns – they bring the fun to their social profiles too. Take a quick glance at their YouTube videos. Better yet, peruse their Facebook page (oh wait, they “broke up” with Facebook. Ha!). Their Twitter account is amazing too (be sure to look at replies). All of their social channels have a similar flavor. Oh, and just to prove they actually interact on social media, I tweeted to them. The ensuing conversation was pretty awesome. They’d already won my heart, but this Twitter exchange made me love them even more. Let me direct your attention back to my last sentence. The (human) exchange I had with Eat24 on Twitter made me love them even more. I had a conversation with a company* on social media, which led me to become an even bigger advocate for them. Think about the power of that for a minute – a company was able to win me over by relating to me. It started with that amazing “weekend coupon” email, moved onto Twitter, and now I’m sharing it with you…in this blog post. Powerful stuff. *To be clear, there is a human (or team of humans) behind the @eat24 Twitter handle. I think. I know what you might be thinking: “That’s great for Eat24, but how does it help me do my job better?” How does infusing human-ness into your marketing campaigns help with what matters most to the C-Suite? Does “being human” drive more revenue for Eat24? More orders? More partnerships? I’m not sure if Eat24 knows, either. To be fair, it’s not easy to split test “human” vs. “non-human” emails. That being said, I do feel confident that from a consumer standpoint, we’d all prefer fun and human over dull and robotic. Good marketing is about storytelling, not selling. Good marketing is about relating to people on a human level, not treating them like a number. If done right, good marketing will lead to excitement around your product or services which (fingers crossed) leads to more sales, more revenue. What do you think, oh fellow human? * Agree? Disagree? Drop us a line in the comments below. *Opinions from robots are also welcome. #DIGITAL: The Best Example of a Human Email…EVER.